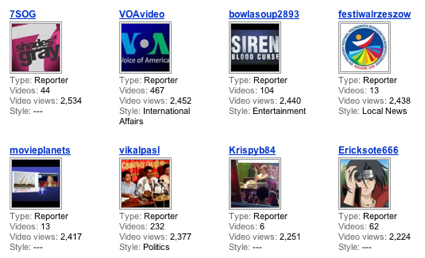 The Vikalpa Video Channel made it to the top 100 most viewed channels on the YouTube Reporters category this week. The interest in and traffic to the site was largely generated by over 30 short videos on July ’83 available here. To put this significant achievement in perspective, the global media giant Voice of America’s YouTube channel generated 2,452 views to date on the YouTube Reporters category. 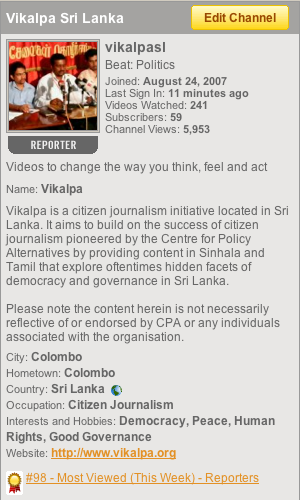 CPA’s Vikalpa Channel has generated 2,377 at the time of writing. This is the second time the channel has made to the top 100 list. The first was in December ’07. Writing on Sri Lanka’s growing abductions, Burning Bridge noted recently that a video produced by Human Rights Watch on this disturbing issue had (at the time) only been viewed less than 2,000 times. Of the many possible reasons for this, one striking feature of many human rights / humanitarian advocacy in Sri Lanka is how little they leverage new media, social networking and well established (web) content management platforms for video like YouTube. We’ve got well over 104,000 views to date and over 2,300 this past week alone for our videos, that are largely in Sinhala and Tamil and also feature notable figures from polity and civil society speaking in English such as TNA MP R. Sampanthan, Tamil Human Rights Activist Shanthi Satchithananthan and Convener of the Civil Monitoring Committee Mano Ganesan. I just need to find the time to sit down and write about the lessons learnt and identified as well as the technical and content generation and dissemination strategies adopted by us to make the channel what it is today and to take it forward in the midst of and as a response to the incredibly violent and difficult context for independent media in Sri Lanka.